When Nintendo�s marketing team set up a booth at the AARP convention this fall, it was a drastic departure for the video-game seller, which generally targets a far younger demographic. 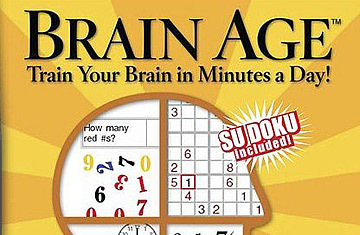 The goal was getting senior citizens excited about Brain Age: Train Your Brain in Minutes a Day. The game, based on a Japanese neuroscientist�s research, has already sold more than 600,000 units in the Americas since its release in April, and that has industry executives paying attention. The over-50 set is a largely untapped and potentially lucrative market, and toy and gaming companies are starting to court the boomer generation with products claiming to help sharpen memory and cognitive ability. �People are realizing that lifestyle can protect not just their hearts but also their brains,� says Dr. Gary Small, the director of UCLA�s Center on Aging. This month, Radica, a subsidiary of Mattel, is rolling out Brain Games, a handheld device containing word hunt, memory and sequence games, based on Dr. Small�s research. �This is a far cry from what Mattel would typically do,� says Chris Wilson, Radica�s vice president of marketing. Other products include Sharp Electronic�s new EL-T100B Brain Exerciser, which challenges users with math drills meant to increase blood flow to the brain. And CogniFit, winner of the 2007 American Society on Aging�s Business and Aging Award, is courting retirement homes interested in purchasing its MindFit software. CogniFit�s Yossi Mazel says their game, MindFit, is tailored to each person�s profile. �As you go through the training,� Mazel says, �the difficulty and the challenge of the exercises is adapted to your learning curve.� Individuals can purchase the software at www.e-mindfitness.com, but the company is primarily marketing to retirement and assisted living facilities. When Jewish Home residents Lino Zambrano, Suzanne May and Dorothy Creager tested handheld games for TIME, they favored the Sharp calculator, mostly because they were familiar with the technology. Creager had a hard time reading numbers off the screen in some Brain Games exercises. A company representative says the unit�s $20 price explains why it�s less sleek than Brain Age, which is a $150 commitment because users must first buy Nintendo DS.